The year is 1912, 25 years after the death of Dracula, and the heroic group who pursued and killed the vampire have gone their separate ways. Seward is now a morphine addict obsessed with tracking down vampires, Lucy’s fiancé Arthur is in a loveless marriage, Jonathan frequently leaves Mina to seek out prostitutes and Van Helsing is an infirm old man. So begins the sequel to Bram Stoker’s infamous novel Dracula, Dracula: The Un-Dead written by Stoker’s great-grandnephew, Dacre Stoker. In the opening pages, Seward is pursuing Countess Bathory, a female vampire. He watches from a hidden spot as the vampire and her “Women in White” kill an innocent young woman and feast on her blood. After the gory meal, Seward is discovered and the vampires flee. Seward follows them to Paris, where we soon meet Quincey, the son of Jonathan and Mina. Quincey wants to abandon his studies for the stage and is encouraged by Basarab, a well-known actor. While Quincey follows his idol Basarab from place to place, Seward is found dead. Next Jonathan is killed. Both men are murdered in ghastly ways, reminiscent of the style in which Dracula killed his victims. Has Dracula returned? When I first saw this book, I was excited to see a sequel to Dracula, one of my favorite books. 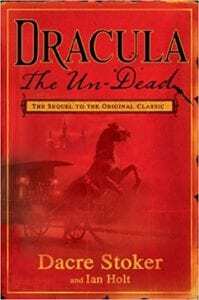 Noting, however, that Dracula: The Un-Dead was written by Dacra Stoker, a relative of Bram Stoker, I was concerned that the author was hired to write the book simply because of his last name. Could he write? While the book won’t win any awards, the writing is acceptable and the story is reasonably well-paced. It’s the story line with which I had problems. The first hint of problems came in the chapter where we meet Bram Stoker, a frustrated director working on the play “Dracula.” I realize the author wants to pay homage to Bram (it’s obvious from his author’s notes at the end), but this is going a bit too far. Further, Dracula plays a secondary role in this tale, particularly during the first half of the story. Dracula: The Un-Dead begins more as story of Mina versus Bathory, a vampire who is determined to destroy Mina. It should be mentioned too, that Mina has maintained her youthful appearance because Dracula’s blood flows through her veins. Is Dracula her true love? Is Quincey their love child? Perhaps more disturbing than the above is Dracula's changed nature. "Dracula was indeed a killer, but he was not cruel" (pg.322) and in Dracula's words, "Van Helsing tried to secure his place in history by naming me a villain through Stoker's pen" (pg. 353). If you’re a diehard fan of the original, you’re apt to find that this sequel transforms the characters and the story linetoo much. Could Dracula really be working for God, "doling out God's justice"? If you enjoy all sorts of variations on the Dracula theme, then you may find this book to your liking. Quill says: There’s plenty of action, but the many changes to the story may not appeal to fans of the original.